One AV System. Three Different User Groups. 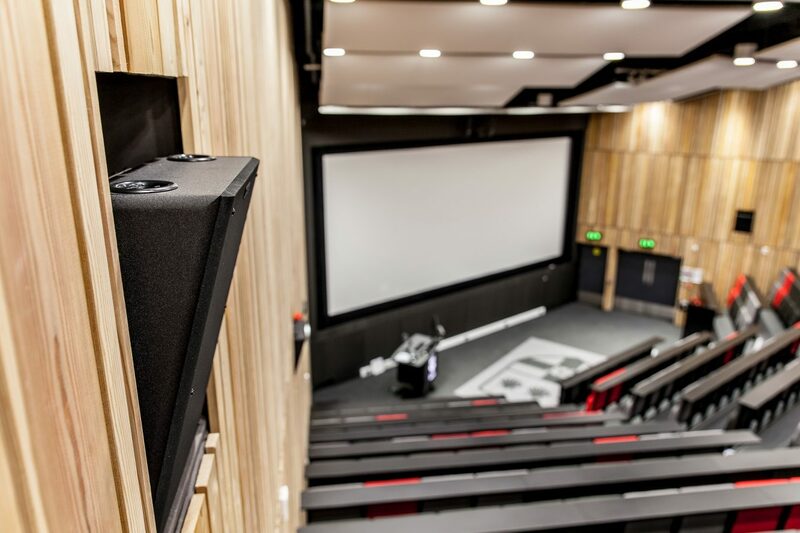 How can a single, versatile AV environment uncompromisingly deliver student lectures and private hire events, in one space, which is also a fully-functional Dolby cinema? 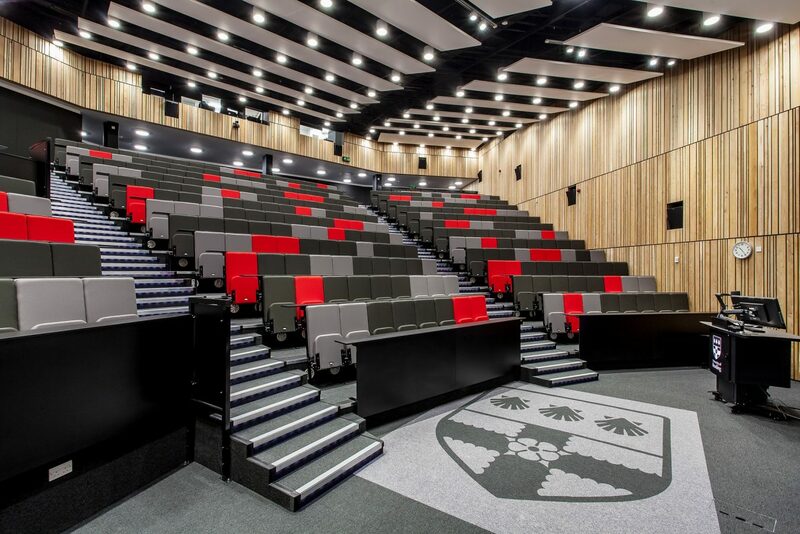 400 seat venue in the Palmer Building (Whiteknights campus) is the largest on campus and also home to a fully-functional cinema for the Reading Film Theatre. 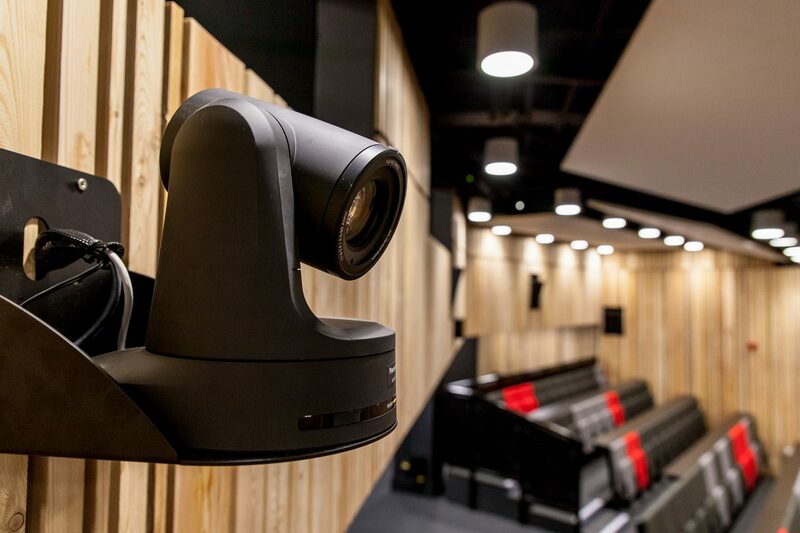 Part of the £200 million campus redevelopment framework, which mandates a revamp of the theatre’s AV capabilities; one which is robust, versatile and highly scalable in its operation for varying needs and requirements of multiple audiences. 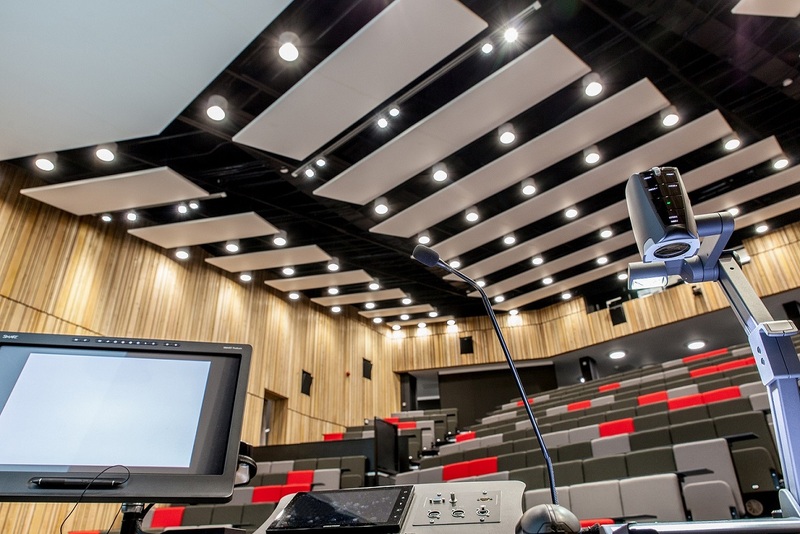 The largest lecture theatre on campus was fully refurbished but its utility remained the same as before. Three separate audiences with widely varying requirements and technical prowess. Systems were delivered for flexible use and with ease without necessitating prior training. In effect specified a new system, which is scalable and resilient in its design, intuitive to use by in-house IT technicians, and be future proof via I/O expansion, whilst being IT-friendly. 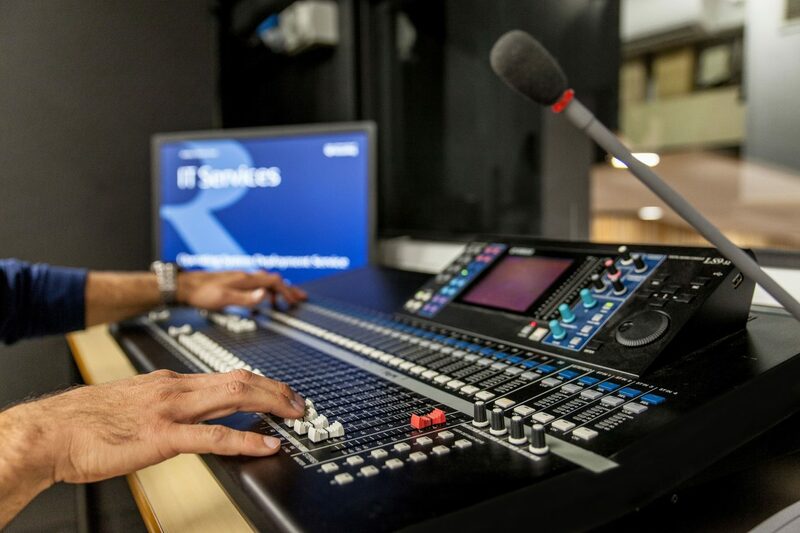 It specified one system to deliver presentations during seminars or lectures (including speech reinforcement), capable of recording and streaming lectures live, and serving the purpose of a fully digital certified cinema for the Reading Film Theatre. At the same time, technical and non-technical users had to be able to switch easily between the different modes as and when required. 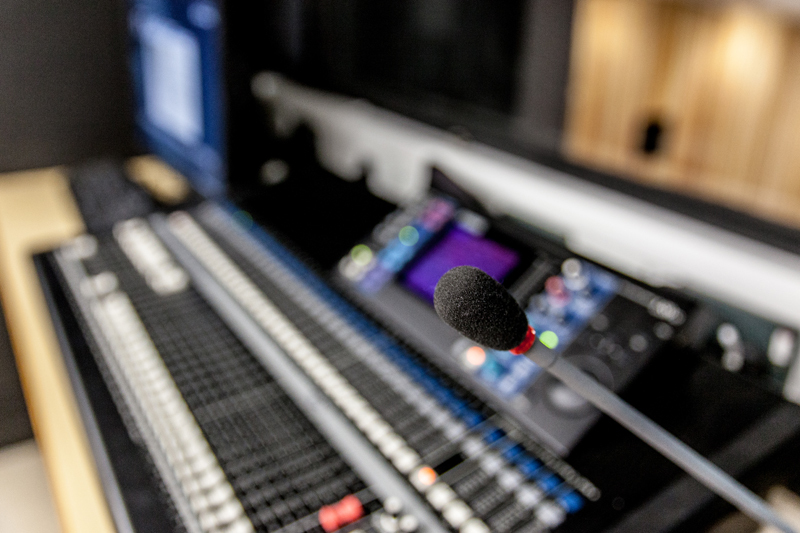 How can we design and integrate one audio and projection system, which is at par with any digital cinema in the country, with the control and versatility of a lecture/conference venue vested within a lectern and a technician control room? Above all, G10 not being a new build posed many structural, acoustic and architectural constraints from an AV integration perspective. 1) Standard lectures – automated system; simply walk up to the lectern mounted touch surface UI/UX and start using without necessitating prior training. 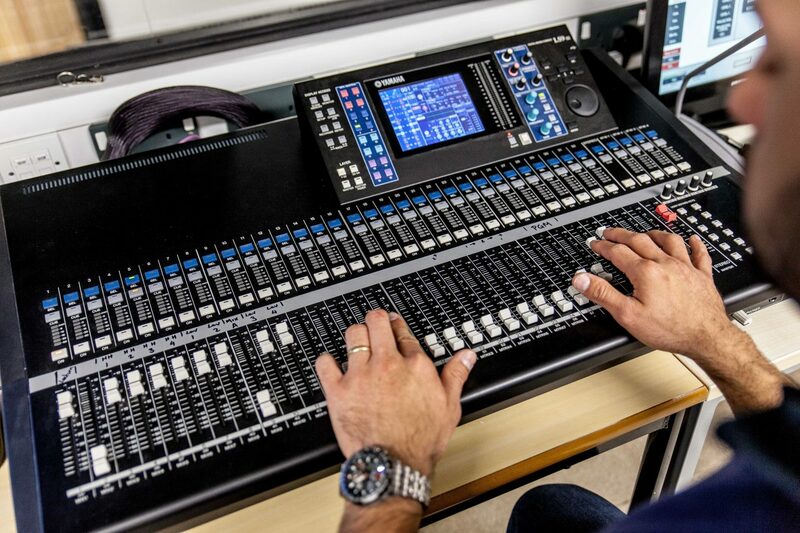 2) Technician mode – allow patching and routing of multiple I/O’s; be controlled via iPad or the physical digital mixing desk in the booth, allow for IP streaming via DANTE, and be remotely monitored via the University’s third party control platform Crestron Fusion RV. 3) Digital cinema – in partnership with a leading independent cinema group, the system had to provide Dolby and THX certified audio feeds for Reading Film Theatre. › Projection aperture had to be widened to meet specifications of the new projection equipment, and for which specialist contractors were appointed. › Projection screen was custom-designed by a specialist manufacturer because the depth of the wall was not sufficient to support the larger screen specified for the project. › Central projector being unable to support Keystone, required the lens to be custom cut by a specialist glass-cutter to meet the pixel specifications without exceeding the budget. › Many changes were made to the physical attributes of the theatre to accommodate a THX and Dolby certified cinema system, which provide standards and best practices for architectural design, acoustics, sound isolation and audio-visual equipment performance. In case of a lecture or events such as Conferences and Seminars, the lectern is equipped with digital and analogue input, along with control of the amplification, speech enhancement as well as Side-by-Side projection control with Stereo Audio. 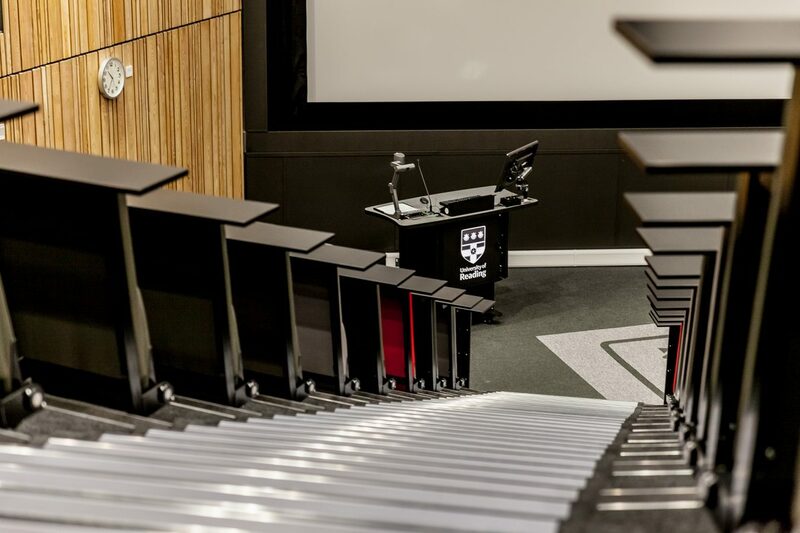 The lectern in these applications will act as any other lecture theatre, enhanced by upgrades to the Audio-visual processing and output quality expected of the largest theatre on campus. 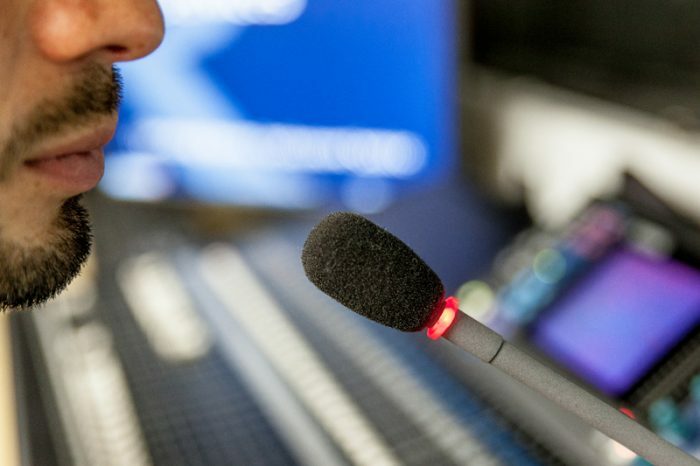 An added advantage is making the theatre broadcast ready; multiple tie lines allow broadcasters to stream live from the theatre. In addition, the proceedings can also be broadcast live onto the LED wall situated outside the Palmer Building. Switching to ‘cinema-mode’ can be as simple as a flick of the switch- all controls are transferred to the projection control booth located at the rear. 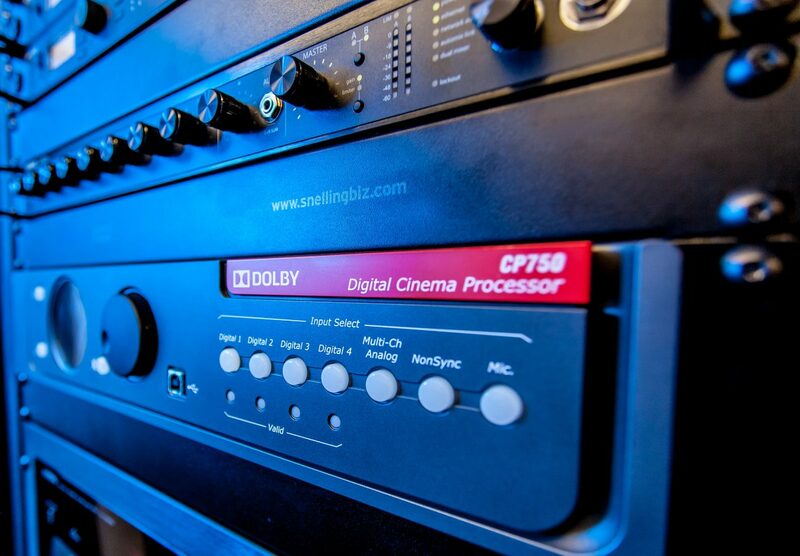 Several customisations were made in order to meet THX and Dolby certification requirements. 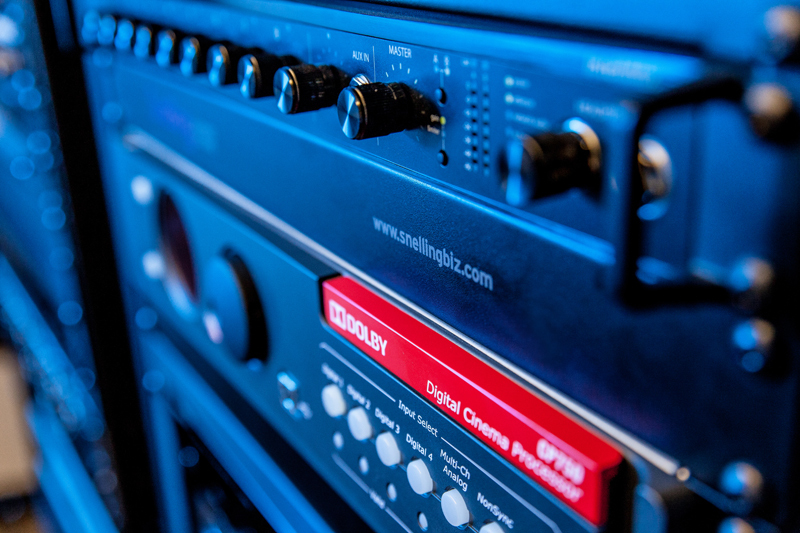 No compromise was made on audio capabilities with careful considerations at sys-tem design stage to ensure the best technology was chosen from proven industry partners. All of these requirements had to be balanced with the carbon credentials goals of the University. It is standard protocol at Snelling Business Systems to consider carbon footprints and energy utilisation. 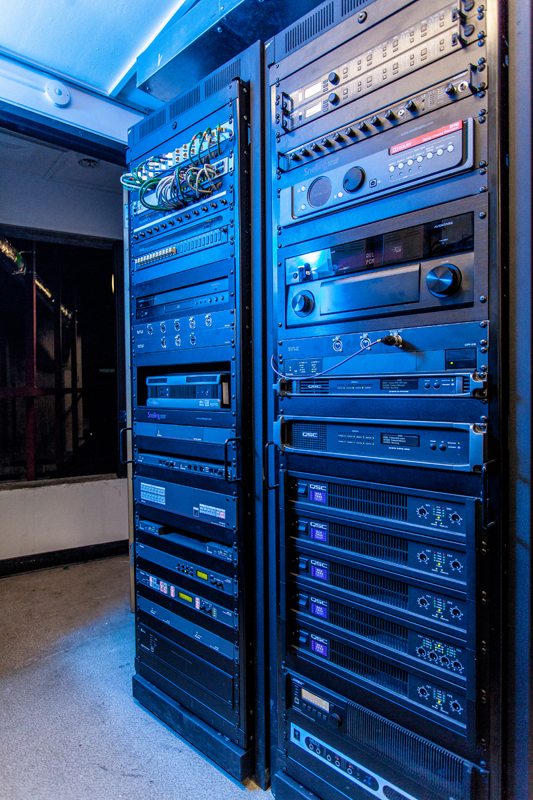 Taking initiative, the systems were linked to the University’s Crestron fusion RV (remote management system) to shut down the entire system when not in prolonged use. This was done over and above the client’s expectations. APC power distribution units were also deployed for all equipment, which remotely shuts down any connected device on a per outlet basis and enables IP monitoring of the power consumption of each connected device. This helps reduce power consumption to Zero Watt over Weekends, Evenings or Vacation Periods besides manual remote access to switch off all systems. “Many things have impressed me about Snelling. They were left with a sketch of what we wanted and delivered the system without fuss. It’s rare to find someone who can deal with both the institutional demands of a University and the highly specialised requirements of a cinema sound system. 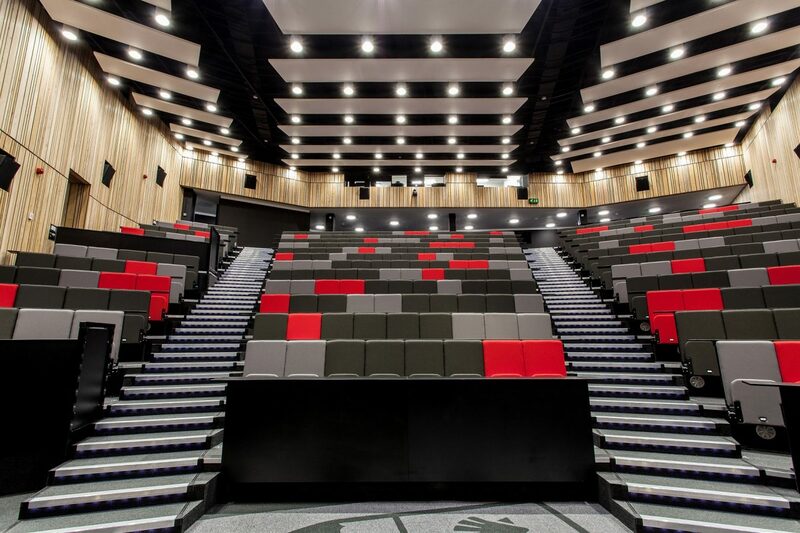 Over and above client expectations, Carbon Offsetting vouchers were provided for the G10 Theatre; a scheme setup by Snelling Business Systems and Panasonic together. Under this scheme, every kilogram of CO2 emissions over a 5 year lifespan is offset by planting saplings in commensuration. Download the G10 Cinema Casebook below. Art School students find impetus to experiment with newer and more interactive ways of art interpretation, beyond art hung on the wall? AV systems complete a building designed for the next generation of public policy makers to learn from each other’s experience of making governments work better? AV systems for a Science faculty; designed to encourage collaboration and built for use without necessitating prior training. How can AV systems be built to meet an ambitious target of 168 Kgs. of emitted CO2 (kgCO2e/m2) over a 100-year period? How can AV/VC/IT systems complete the brand of a Central London landmark, headquarters of a global professional society, and ‘Best UK Venue Brand’ for corporate events three years running? © 2019 Snelling Business Systems Ltd.